Notes All three body styles that had been available with the XK120 were available immediately. These were the Roadster - 2 seater with sidescreens, detachable windshield, and hood. Drop Head Coupe (DHC), fixed windshield, wind up windows, 2+2 seating, and attached hood. Fixed Head Coupe (FHC), 2+2 seating, wind up windows. Launched at the 1954 Motor show the XK140 was very much an evolution of the XK120, and introduced several practical drivability features, including rack and pinion steering, replacing the 120's recirculating ball system, and telescopic dampers replacing the archaic lever arm dampers. Some options previously fitted to the XK120SE model like the more powerful engine, and thicker torsion bars were now made standard. The engine and bulkhead were moved forward three inches compared to the earlier cars, and the extra space used to fit occasional rear seats (albeit very small!). The roadster did not have the extra seats. The exterior changed little from the 120, except for the fitting of much heavier bumpers, similar to those on the large MK VII. However the FHC roofline was extended backward and 1 1/2 inches up, to give much more space inside than the 120 FHC. Another identification point is that the car was outfitted with more chrome and badges than the XK120, including chrome strips along the middle of the hood and trunk. A cast radiator grille with fewer and thicker slats replaced the more delicate and expensive XK120 item. A nearly identical design was later to be used on the Jaguar 2.4 liter (MK I) in 1956. 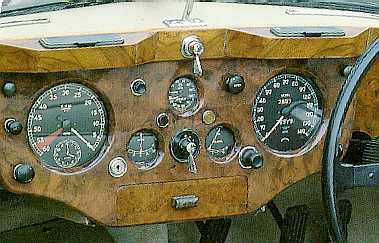 Like the 120 before it, the FHC and DHC continued to have dashboards and door cappings covered in walnut wood, whereas the roadster had a leather covered dash, padding on the tops of the doors, and side screens for weather protection. Engine was the Jaguar XK type DOHC inline 6. No statistics seem to be available on how many cars were produced in SE trim but it appears to be rare. Rear Live axle, semi elliptic leaf springs. Telescopic dampers..
Standard Equipment Heater, Leather seating on all models. gave standard wire wheels, two foglights. overdrive and twin exhaust system to replace standard single pipe.. As with the XK120 a futher option was an more powerful 210 bhp engine with the "C" type cylinder head and larger 2 inch SU carburetors. When steel wheels were fitted, spats were fitted in the rear wheel wells. These were omitted in cars equipped with steel wheels because of the extra width of the spinner. Wheels were all 16 inch, and wire wheels had 54 spokes. Windshield washer.